As I sit here in sunny California I’m thinking of a pattern of human migration we discovered while cruising Pacific Mexico last winter. We found west coast Canadian and U.S. boaters flocking south in the fall heading towards warmer Mexican waters. The human race has nomad roots that date back to when we were all hunter-gatherers. We all used to migrate with the seasons. But these days those of us who have jobs and family connecting us to one place tend to stay put in that one place. In our case, being rootless and fancy free, we are drawn in the early fall to the west coast cruising grounds of Mexico. We have this in common with the Rufous Hummingbird and the Humpback Whale. Our cruising grounds are located on the southern central end (northern hemisphere) of our Pacific coast of America’s “flyway”. This cruising region consists of three distinct areas: Pacific coast Baja peninsula, Sea of Cortez, and west coast of mainland Mexico. Unlike here in the Pacific northwest where we tend to do the majority of our cruising in the summer, in Mexico we cruise in the late fall, winter and early spring. The migration schedules we’ve observed down there are influenced not only by location, weather, and sea state, but also by social influences like holidays, festivals, airfare pricing, tax time, immigration rules and marina discounts. What? How can immigration rules determine when you might round Cabo Corrientes? We’ll get to that momentarily. First let’s talk of general trends in the cruiser migrations. In any location, there are good months and bad months, weather-wise and sea-condition-wise to travel in Pacific Mexico. On the Pacific side of the Baja Peninsula most of the boats head south from the United States around Halloween. That’s when the popular Baja Ha Ha rally happens with more than 100 boats moving en masse down the coast towards Cabo San Lucas. The hurricane season in Mexico peters out by the Dia de los Muertos (Day of the Dead) and gringos take the opportunity to swarm south like clouds of bees seeking warm waters and an escape from the cold winters in the U.S. and Canada. Cruisers who like to cluster together join the Baja Ha Ha hive. Other, more solitary cruisers buddy boat or buzz solo down the coast in November. At this time of year the wind blows consistently from the north providing cruisers with a nice broad reach all the way down the outside coast. After an expensive stopover at the tip of the Baja Peninsula the armada divides in two with one half rounding the corner and heading north to La Paz and the other half reaching across to Mazatlan on the mainland coast. In the meantime, those cruisers who left their boats in Mexico for the summer arrive by plane and take their boats out of storage, having left them in a dry dock or at a safe marina for the summer, sprinkled around the safe harbors of San Carlos, Mazatlan, La Paz, Banderas Bay and Barra de Navidad, to name a few. After scraping the summer dirt and dust off the boat these snow birds will likewise take advantage of the strong north winds to fly south towards warmer seas. Thanksgiving and Christmas find many boats at the marinas while skipper and crew return to Canada or the States for the holidays. Then, in January the exodus continues its southward push. In February, those people who love to party at Carnaval will arrange to be in Mazatlan or La Paz, lagging behind the greater fleet. In March sailors flock to Banderas Bay for the big regatta there. Given the quantity of holidays and festivals in Mexico boaters will find their favorite celebrations and attend them again year after year, adapting these to their migration timelines. Last season we chose to round the cape in early December and beat north towards La Paz to take aboard a few friends. We ran into Robert and Virginia Gleser on the ketch "Harmony" at Los Muertos where we waited for the “norther” to blow itself out before continuing. “You are going the wrong way!” they said while we had sundowners on their back deck. These two are seasoned wanderers and knew the established flyways well. We spent Christmas in the bay at La Paz and suffered through wearing socks and long sleeves and rowing the dinghy through the choppy cold bay while wishing we’d joined Harmony in the southern waters. If the flock is flying south you better get on the wing! After the New Year we rocketed across the Sea of Cortez on a beam reach and kicked off our coastal adventures from Mazatlan, heading south with the wind behind us and the temperatures rising with every mile made good. Around us we saw other boats migrating in the same direction, talking to each other on the VHF radio and calling ahead to friends already at the anchorage. I imagine it like an ant trail wandering down the coast; messenger ants going to and fro guiding each other toward safe harbors. We all huddled together in the northern part of the mainland Mexico coast and as time went by the faster boats migrated farther down the coast. Some chose to harbor hop with short morning passages. Others went miles offshore and knocked out a couple hundred miles until they came back in for a rest. If you are a social creature you’d meet new friends at every anchorage so that down the line you’d run into them again and have a homecoming. The rule of thumb is to get the anchor down, then scan the anchorage for friends before readying the dinghy to go visiting. Previously, I mentioned that immigration effects migration. Well, some boaters find a marina after they’ve been in Mexico a half year so they can stash the boat while they fly back to the states to renew their six month visa. Without a FM3 visa you can only spend six months legally in Mexico. The boat can stay for years, the crew cannot. Folks also fly home at tax time to take care of business, while others time their flights for their kid’s spring break. Late winter finds everyone clustered down south near Bandaras Bay, Barra or Manzanillo with a small contingent heading further south towards Zihuatanejo, Acapulco and beyond towards Costa Rica and Panama. Another group gathers in Banderas Bay starting their final outfitting for the Pacific puddle jump in March. 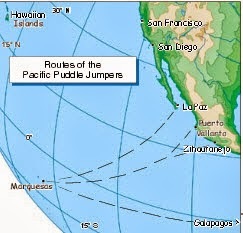 The wonderful thing about being a puddle jumper is that you can enjoy the cruising season in Pacific Mexico then just when the hurricane season approaches you jump across the equator to the south Pacific and start your cruising season again right away. Of course you’ll be thousands of miles upwind of Mexico when the cyclone season starts so you’ll have to run down to New Zealand or Australia for the summer. All around the world are these fly- ways for cruisers where there is an ebb and flow to boat movements and transits. Jimmy Cornell’s World Cruising Routes details these migration routes that have been observed first hand by sailors ever since seas were first sailed. Back in Mexico the wind blows consistently from the north. We listen to the single sideband nets for weather information looking for short breaks in the norther so we can hop a few miles north to different anchorages. We wait for the lull, power north for a day and duck behind a headland to a new anchorage before the norther picks up again. One of our favorite areas is the Tenacatita / Barra de Navidad / Manzanillo area. 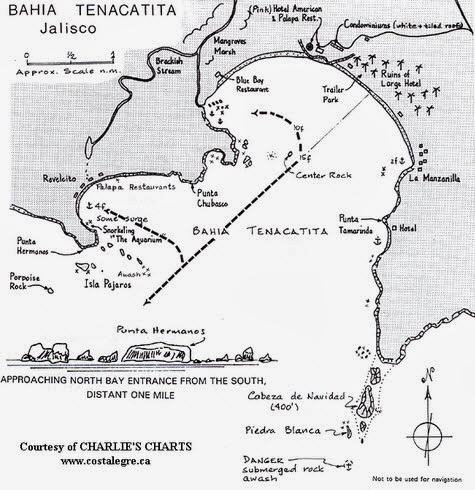 All three of these locations are within a half day’s journey from each other and are near the southern terminus of what is called the Costa Alegre, or Happy Coast. At Tenacatita we anchor in pristine clear water, in a lovely unspoiled beach lined bay. It’s a great place to kick back, make new friends, play bocce ball on the beach or Mexican Train under the palapa then return to the boat and hand- clean its bottom. Good surfing and snorkeling are just around the corner to the west. Barra has a couple things going for it too. The little town is a delight with little tienda’s for your groceries and multiple fresh fish markets. More shopping and dining opportunities are a bus ride to the north in the beach town of Melaque. Adjacent to Barra is the lagoon where you can anchor safely in the shallow muddy water. And just a quick water taxi ride away is the beautiful marina and resort at Grand Bay. We love to pull into the marina there for a few days to clean the boat, get provisions, and take advantage of the resort’s pools and hot tubs. Then, once we’ve had our fill of town and marina life we find a little break in the norther and sneak around the cape back to Tenacatita. Mid spring some of the sea gypsies get restless and start taking advantage of the infrequent pauses in the norther to inch their way back up north. This effort takes good timing and can test the seaworthiness of your boat and equipment. Experienced cruisers relax during this time, taking the dinghy ashore to the palapa restaurants to enjoy the ceviche and a cerveza while they think about their impatient friends bashing their way up the coast. At precisely May 20 they say the north winds cease. It is then, and only then that the last remaining cruisers on the Costa Alegre set out on a broad reach to their chosen summer locations north. We were told about the hard and fast May 20 rule and didn’t believe it... and we headed north before May 20 and encountered stiff headwinds on the way. Later in Mazatlan one day the north wind stopped and the next day a gentle breeze blew up from the south. Sure enough, it was May 20. With the spring exodus the southern coastal towns lose their Canadian and U. S. customers and once bustling little towns become quiet and peaceful again. The marinas in Banderas Bay and Mazatlan start to fill and the boat mechanics get to work fixing what has broken during the winter cruising season. Dry docks start working their travel lifts and boat crews spend time readying their floating winter homes to be abandoned for the long, hot summer. A hardy crowd heads to La Paz and harbors north to enjoy the Sea of Cortez until the heat becomes unbearable. By August only the tough old salts remain in the sea as the rains begin and the storm season sets in. Everyone else has flown the coop! Come October, it starts all over again. 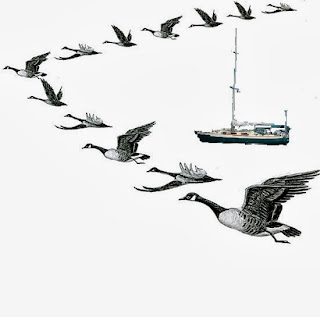 As I think about the yearly migrations of Canadian and U. S. sail and power boats I’m reminded of the big V formations of Canada Geese we see winging their way south for the winter. Like the Canada geese, sometimes we boaters find a comfortable little place and just stay put year around. That’s what I’m hoping for in the future, that we’ll attend many migrations, both here on America’s west coast and around the world, and we’ll finally settle on one sweet little spot. We’ll make ourselves a little nest of a house ashore and trade our big boat in for a coastal sailing vessel or a little putt-putt motorboat. Then we’ll watch the flocks of cruisers come and go with the seasons. Do you do the illustrations? I have to say they are very good. Great blog.